In a large frying pan with a lid, heat 1 tablespoon of the oil over moderately low heat. Add the garlic, couscous, cumin, cayenne, and ½ teaspoon of the salt to the pan. Cook, stirring occasionally, until the couscous starts to brown, about 3 minutes. Stir in tomato juice and water. Bring to a simmer. Cover, remove from the heat and let stand for 5 minutes. Transfer the couscous to a platter or large glass bowl to cool. Meanwhile, heat the broiler. Coat the sausages with ½ tablespoon of the oil. Broil the sausages, turning occasionally, until completely cooked through, about 10 minutes. Remove from the heat. When the sausages are cool enough to handle, cut them into thin slices. Toss the cooled couscous with the lemon juice and the remaining oil, salt and tomato. 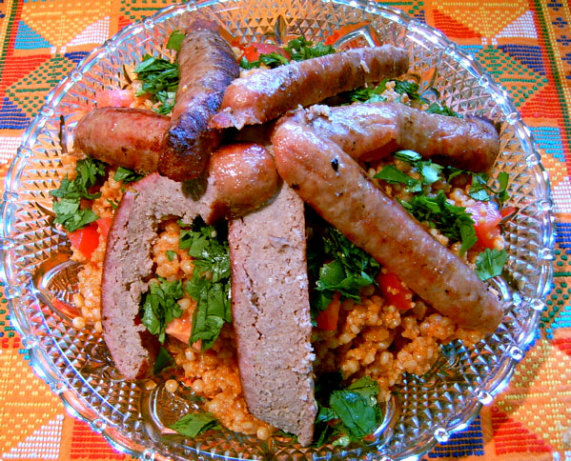 Top with the sausages and cilantro.